We went on our first camping trip this past weekend. I realized too late that it was a tad crazy for me to have planned a birthday party on Thursday afternoon followed by a camping trip on Friday. But I managed to squeeze all the preparations in, though everything else was a bit neglected last week as a result. Anyway, we wanted somewhere not too far away for our first attempt. I looked through a book someone had lent me and found Dash Point State Park. It feels a bit silly to say you're camping there when reality is that you're 2 minutes from suburbia and maybe 10 from a large mall. But it is only about 45 minutes away from us, in Federal Way, and seemed like a good choice for our first attempt. I was rather nervous heading into the trip because it was forecast to rain through the weekend. Luckily, the weather was lovely on Friday. I'd prepped some food Thursday evening and then we spent Friday morning packing. It was extremely tight fitting everything in our little car, but we managed to squeeze everything in this time around. We weren't supposed to arrive to check-in until after 2:30, so we left after Malcolm napped and arrived late in the afternoon. There wasn't anyone there to check-in with, so we just went to our reserved site and started getting set up. Things looked rather muddy, but otherwise okay. 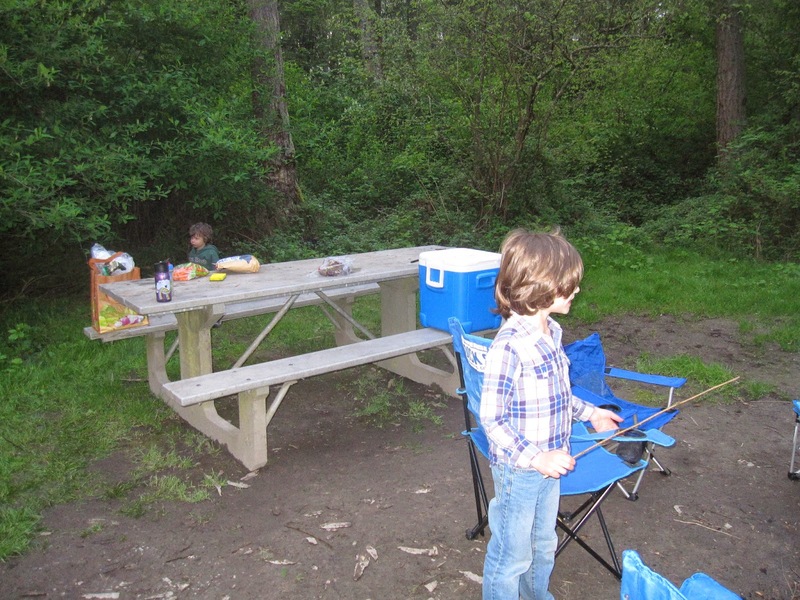 We realized we wouldn't need our camping table as there was a large picnic table on the site. Ryan got the tent set up mostly by himself while I kept Malcolm entertained. Someone had told me we'd almost certainly be able to buy firewood at the park, but upon arrival we could find no sign of being able to do so. So Ryan went to a store to try to find firewood while I went in the tent with the boys and worked on getting settled in. They were both very excited about being inside the tent. It was at this point that I realized we forgot to pack pillows. Not that we had room for them anyway. Ryan got back, unable to find real wood at the store, but had gone ahead and purchased some of those fake ones. I got dinner heated up, a recipe that we normally wouldn't make again as it we could tell it was just "meh" when eating comfortably indoors, but it tasted quite good when eating outdoors, so we might hang onto it as a decent camping food recipe. Once we got dishes cleaned up we set to work starting a fire. The fake logs worked well enough if you just want a fire, but they didn't work at all for marshmallows. The marshmallows just turned an ashy grey color and weren't at all what Ryan and I remembered fire-toasted marshmallows being. So we didn't let the kids eat those, which was terribly disappointing for Gareth. To mollify him I made him a s'more with an un-toasted marshmallow and promised him next time we camp we'll be sure to get actual wood. Then Gareth and I played Connect 4 and let Malcolm join in on a couple games. By that point it was quite dark, and Malcolm was getting fussy and cold, so we got the boys ready for bed. We were worried about Malcolm getting cold, so we kept his socks on under his footie pjs, then put a sweater and his jacket on on top of the pjs and put him down with three blankets on top of him. Ryan and I stayed up until the fire died, and then put together some make-shift pillows for ourselves, which proved extremely inadequate and made for a poor night's sleep. I was expecting to wake up to rain the next morning and wasn't sure how cooking breakfast was going to go if it was pouring rain. But it wasn't raining when I woke up, so I quickly got to work on whole grain pancakes for our breakfast. It took me a while to get it right - several were underdone in the center and many were burned on the outside, but by the end I think I had it down pretty well. I forgot butter, so just had to cook them in a little oil, but that seemed to work just fine. Ryan helped corral the kids while I finished breakfast clean-up and then I took Malcolm on a walk. There was a trail head just a few feet from our campsite that was supposedly a loop, so I decided Malcolm and I would explore that. We found a small stream with a bridge over it from which Malcolm enjoyed throwing rocks into the water. Unfortunately, the loop turned out to not be a small one and we reached a fork that didn't have clear signage as to how to continue on the loop, so I opted to have us turn around and head back. Good choice, because just as we got back it started to rain. It wasn't easy keeping the boys entertained inside the tent. It was cold and rainy enough that it would be unpleasant to be outside, especially since Gareth was the only one with rain boots. We played many games of Connect 4 and Trouble. Malcolm took a small nap quite a bit earlier than usual, and we all read a bit. There was a lot of shrieking from Malcolm, which was particularly annoying inside the confines of the tent. Eventually it came around to lunch time. I'd planned on sandwiches for lunch, so I went out in the rain and set things up so that we could prep sandwiches and eat in the car, only to arrive back at the tent and see everyone had fallen asleep! Once Gareth woke up (thereby waking everyone else up) we ate lunch. Our campsite was getting muddier by the minute, so eating outside still wasn't a terribly appealing option. The boys seemed to enjoy eating in the car and we turned the car on for a bit to charge Ryan's phone and let us all get warm. By the time sandwiches and apples and Pirate Booty had been consumed, the boys were getting a little too excited and energetic for the car. Thankfully the rain had let up and so I took the boys for a walk on the trail that Malcolm and I had explored earlier. Ryan tried to follow us later, but despite us moving slowly, he didn't catch up to us and we were past the fork in the trail before he got there and he ended up taking the opposite fork. Malcolm was a nightmare on the trail because he kept wanting to sit in the mud and eat the leaves of all the plants and run while holding my hand and then go dead weight on me, making me worry he'd pull out his shoulder or otherwise injure himself. We were both quite a muddy mess by the time we got back. When we got back I asked Gareth to keep an eye on Malcolm for a minute while I grabbed some wipes or something from the car. 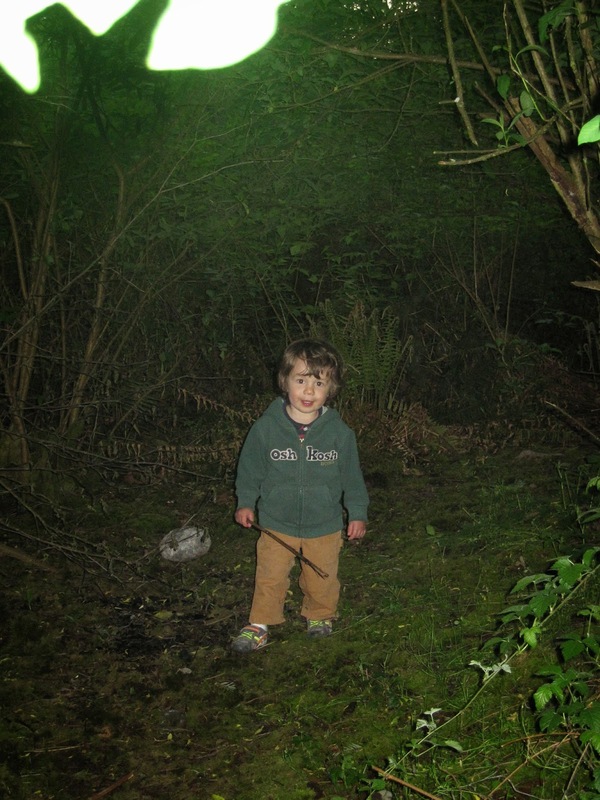 Apparently keeping an eye on his brother meant opening up the fire pit (which was a small pool of ash and water by this point) so that Malcolm could stick his foot into it. It had been sprinkling for a few minutes and was now starting to rain harder, so we retreated into the tent to get out of the rain and change Malcolm's clothes. There wasn't much we could do about his soaked shoes, however. It rained hard the rest of the afternoon, so we played more Connect 4 and Trouble, with only occasional trips out of the tent to use the bathroom or get an item from the car. The mud outside our tent was really wet and sticky by this point, which further discouraged many ventures out of the tent. We weren't sure what we'd do come dinner time if it was still raining, as Ryan doubted we'd want to stand out in the rain for the planned chili. But the rain stopped again around 7pm, so I worked quickly to heat up the chili. 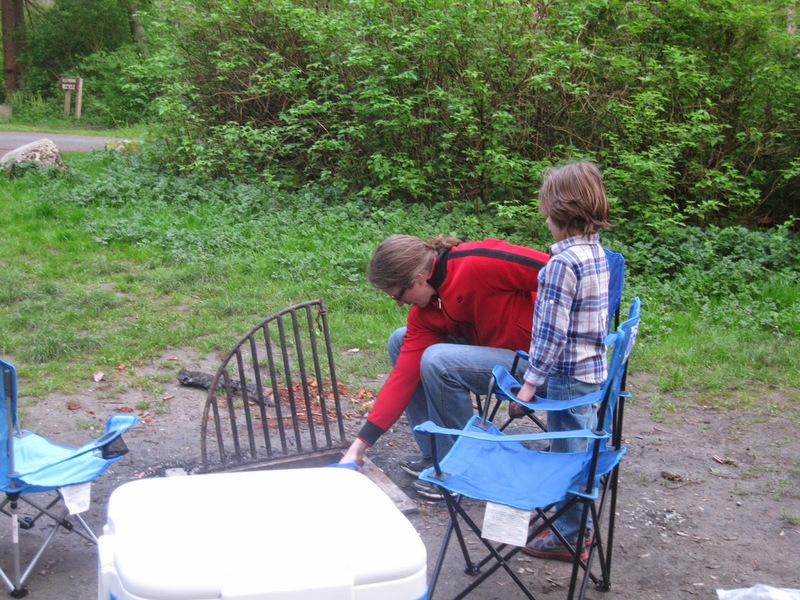 The site was far too muddy to set up the camp chairs around the fire pit or anywhere really, and I didn't want to feed Malcolm chili in the car (he's prone to spitting food out after chewing on it a bit), so I set up the boys' chairs on the asphalt next to the car and we ate dinner there. Malcolm was getting a bit whiny or unruly or something, so Ryan set him in the car and let Gareth in as well and they scarfed down the rest of the apples while I cleaned up dinner in the fast-approaching dark. It'd be too wet for a fire that night, plus it was likely going to rain again. Ryan and I decided that it was getting to be time for bed, so we got the boys settled as it started to rain and then worked to provide ourselves with more sufficient pillows, hoping for a better night's sleep, and hoping that our tent would continue to stay dry despite all the rain. Thankfully, the tent did stay dry, though a good night's sleep continued to elude us. We're both envious of Gareth and his youthful ability to sleep well anywhere. We were up probably no later than 7 Sunday morning. Ryan and I were both tired and, though it'd stopped raining, everything around us was still incredibly muddy and we were tired of having cold, wet feet, so we were ready to head home. We got the boys dressed and fed them bagels for breakfast. While they were eating I worked inside the tent to get everything packed up and ready to go. Ryan then helped me carry it all out of the tent to the car. Knowing we'd want to have the kids in the car while we dealt with taking down the tent, Ryan offered to take them for a walk while I packed the car. This worked perfectly as I had everything stuffed in place by the time they got back. I was glad I'd brought a couple large garbage bags as the tent, and especially the footprint, were far, far too muddy to just fold up and put away. So we folded everything rather loosely and stuffed them in the garbage bags so we could deal with them once home. We were packed and ready to go just after 9. We need a carrier for the top of the car. We need to all have appropriate footwear for the rain and mud. Make sure to figure out the firewood situation ahead of time so as to avoid disappointed children. We need to have whatever is necessary to make putting up a tarp over a food prep/eating area possible, even if trees aren't positioned such to make this easy. Ryan needs to work on stretching so he can be more flexible and sit comfortably in the tent if we're stuck inside during a hard rain. Forgetting pillows is a bad thing. If we go back to Dash Point, we want campsite 23, which did not turn into a giant mud pit, not site 20, which did. Thanks, Alanna, we'll definitely look into that one. 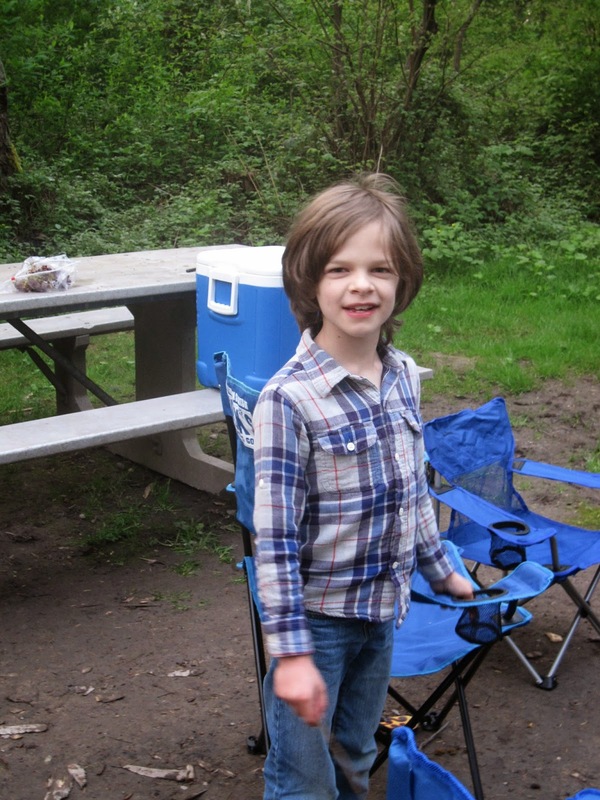 I'm hoping to get in a couple more camping trips this summer and have been trying to figure out where we should go and I think Bainbridge would be a great choice.